From an early age, George has treated challenges creatively. He was given the supreme opportunity to prove himself at age sixteen when he was completely paralyzed by polio. Not being able to move was an obstacle; not being able to communicate was a challenge of another order of magnitude. George mastered both. Recovered from polio, George, then based in Southern California, embarked on a career in real estate development, finance, and investment. Later he became a teacher at the college level where he pursued the study of creative behavior. In 1979, George discovered Apple Computer and left teaching to open one of the first computer stores in the United States. This association with Apple Computer helped George to envision the personal computer's potential for creative use. He later chose to specialize in telecommunications. At "The Beach Street Office" in San Francisco, George and Kent Fillmore designed, built, and operated e-mail and electronic customer support services for local firms. Kent went on to become the first "producer" for a little-known firm that ultimately became the country's first immensely popular online service--America Online. In the late '80s, because of his experience and knowledge, George was asked by America Online to begin a "Communications Forum." For many years thereafter, George put forth stimulating ideas in his weekly chats, including his thoughts on "Information Entrepreneuring." 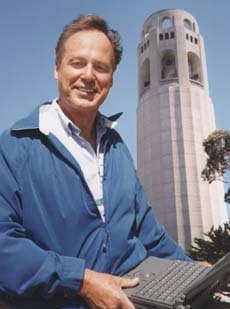 George also conducted the Awakened Eye seminars for Apple Computer and America Online. George, with Mike Bailey, co-founded the High Speed Communications Consortium and the BTI "group," but his most compelling endeavors are related to helping people achieve their hidden potential. Currently George is working on a first novel, a "romantic intrigue." Order via the PayPal option and save. Send e-mail requesting number of books, for whom, and if you want a personal autograph. Specify that you are using PayPal for the payment method. Instruct PayPal to pay to george@urly.com $17.95 each. The price includes shipping and handling.